Pursuit of Poppy: Another snow day! I think it's technically a wind day, but who cares - I got the day off work again! We had our carpet installed on Monday, so I really needed this day to get everything organized upstairs. And I'm working on a grant for school that I've been trying to get done in between classes coming into the library, so today is the perfect time to wrap it up and submit it. Yeah! And I know I haven't mentioned the adoption in a while, but that is of course, due to the fact that there is nothing to mention! Soon, hopefully soon, we'll hear something. 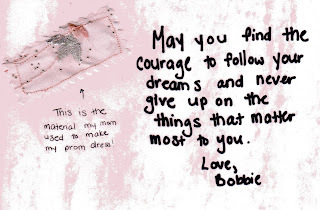 This quilt square is from my sweet cousin, Bobbie. I love the fact she used the same fabric she had her prom dress made with. As I sit here in my office reading this, I again think to myself....Should have been employed by a school district! Lucky!!!!! I am glad that you got some stuff done on our day off!!! I got a lot done too - hee hee!!!! Nice Snow/Wind Day! Glad you got some things done. How about a pic of your nursery with the carpet in it. Or do we have to wait to see it all done? Sorry I didn't get to see you on my trip up. I will be back sooner rather than later. I want to see that nursery. Your brother is doing a great job on Boris' nursery too. Brian said the carpet looks great. I can't wait to see it.